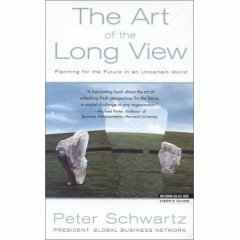 Long Now board member Peter Schwartz‘s The Art of the Long View has topped the list of the most important futures works ever, in a worldwide vote by members of the Association of Professional Futurists (APF). Congratulations, Peter! The Art of the Long View: Planning for the Future in an Uncertain World was first published in 01991, and describes a process for creating and using scenarios to help decision-makers navigate change, as incubated at Royal Dutch/Shell, and nurtured to maturity at Global Business Network (founded in 01987 by Schwartz together with Jay Ogilvy, Lawrence Wilkinson, Napier Collyns and Long Now’s Stewart Brand). The Association of Professional Futurists announced the poll results last month (January 02007). APF is dedicated to “support[ing] professional futurists by advancing professional excellence, facilitating network and community building, and promoting the unique value proposition of futures work”. Founded in 02002, it has some 200 members worldwide comprising professional futures practitioners in consulting, business, and education sectors. Other top-voted futures works were Foundations of Futures Studies: Human Science for a New Era (2 vols) by Wendell Bell; the multi-volume Knowledge Base of Futures Studies edited by Richard Slaughter, The Limits to Growth by the late Dana Meadows et al, and the State of the World series by The Worldwatch Institute.